From a municipal airport in Chattanooga, Tennessee, to a school district in Salinas, California, microgrid projects are popping up across the country, fueled by the desire for energy cost savings, sustainability, reliability and resilience. Applications of this technology, which typically includes renewable energy, energy storage, fossil-fueled generation and load management, can be spotted in critical infrastructure installations such as data centers, military installations, college campuses, office parks and airports. But given microgrids’ unparalleled ability to deliver backup power during an outage and reduce energy costs for a broad swath of the market, these early examples are just the tip of the iceberg. The use of microgrids is expected to skyrocket over the next few years, driven by a broad variety of regulatory and economic factors. For example, the California Energy Commission just passed a new building code that requires all homes constructed after 2019 to have built-in solar power. Builders are required to either provide individual homes with solar or build a shared system for a collection of homes. Once all the homes in a newly constructed subdivision or neighborhood are equipped with solar, it makes sense to add microgrid storage that would deliver backup power in case of an outage. Right now, no other state is considering a rooftop solar mandate, but pending California’s experience, other sun-soaked states eventually may follow suit. In another significant development, earlier this year the Federal Energy Regulatory Commission (FERC) took action (FERC Orders 841 and 845) to remove barriers to entry for energy storage technologies in U.S. power markets. The new rules are designed to “enhance competition and promote greater efficiency in the nation’s wholesale electric markets and will help support the resilience on the bulk power system,” according to FERC. Observers say the new rules will open the floodgates for energy storage companies to compete in wholesale power markets. One research report predicts that energy storage will become competitive with gas-fired peakers in five to 10 years. In certain applications, such as ancillary services or peak shaving, energy storage is competitive with fossil-fueled alternatives now. The FERC decision is expected to spur innovation that should translate into further price declines. On the demand side of the equation, the business community is making a strong commitment to alternative energy. Under the RE100 banner, more than 120 multinational giants — including Apple, Walmart, Bank of America, General Motors, JPMorgan Chase & Co., Starbucks, eBay, Kellogg’s, Johnson & Johnson, Hewlett-Packard and Iron Mountain — have announced a goal of 100-percent renewable energy. In April, Apple announced that all of its global data centers, retail stores and offices in 43 countries are 100 percent powered by renewable electricity, either from solar or wind power. Many of these companies are generating their own energy through rooftop solar and buying renewable-based power from offsite grid-connected generators. In a recent survey of RE100 participants, companies said that in addition to the environmental benefits, the business case for switching to renewable energy is strong. Sustainable energy is now more than environmental policy, it is a competitive advantage. 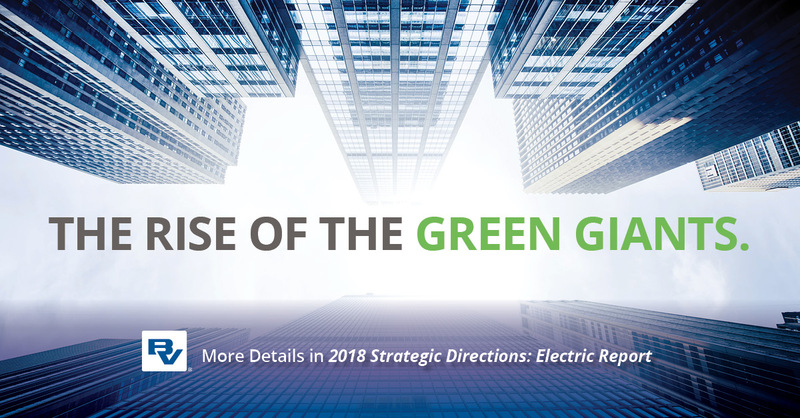 Even electric utilities that may have initially viewed alternative energy as a threat now see distributed, renewable and microgrid energy resources as a transformative opportunity. 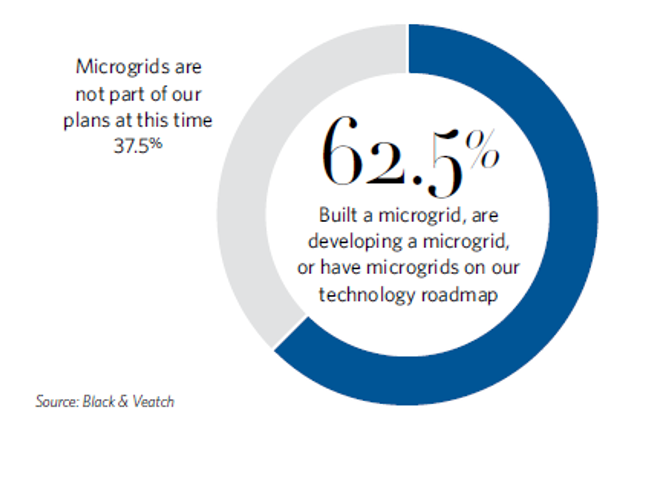 The majority of utilities (62 percent) who responded to Black & Veatch’s 2018 Strategic Directions: Electric Report survey either have built a microgrid, are developing a microgrid or have included microgrids on their technology roadmap (Figure 1). Thirty-eight percent said that microgrids are not part of their plans at this time. When utilities were asked about the benefits of microgrids, improved reliability and resilience came out ahead, followed by integrated distributed generation, reduced cost of energy and environmental benefits (Figure 2). In a noteworthy development, two Pennsylvania utilities (PECO Energy and Duquesne Light) recently testified in favor of a bill that would allow utilities to build public-purpose microgrids that would provide power to essential services in the event of a successful cyberattack. Duquesne Light plans to build a six-building microgrid at its headquarters in Pittsburgh, Pennsylvania. In addition to hardening utility facilities, utilities also are seeing microgrids and DER as a way to better serve their customers, offer a broader range of services and support sustainable growth of the utility business. Early adopters are providing a first look at the major drivers behind the technology, as well as what deployments can look like in terms of partnerships and technologies involved. The Chattanooga Airport, for example, has a solar array that currently supports 85 percent of the airport’s energy needs. The airport is in the process of building a solar-storage microgrid comprising two 250 kilowatt (kW) batteries and all related equipment and software to help integrate this generation. To execute this feat, the city is partnering with Oak Ridge National Laboratory and the University of Tennessee-Knoxville. In Salinas, California, the Santa Rita Union School District is taking advantage of state incentives to deploy solar photovoltaic and energy storage at six sites. The project is based on a behind-the-meter energy storage system. And in San Diego, the Miramar Marine Corps Air Station is establishing its own energy network to keep operations going in the event of a regional blackout. Black & Veatch and Schneider Electric are providing design and construction support on the project, which is scheduled to be completed in 2018. These three projects, although diverse across industry, are all in pursuit of the same goals: increase reliability and resilience against power outages, incorporate renewable energy, lower energy bills, and allow operations to continue if the utility power grid is compromised or damaged. Although enthusiasm for microgrids continues to grow, we are still in the early stages of the movement, and there are challenges that need to be addressed. One of the largest issues stems back to how the traditional energy grid was designed – built for one-way traffic, from the energy generation source to the customer. In the new world of DER and microgrids, utilities need to upgrade their distribution network so that it has the intelligence and capability to take advantage of smart meter data and can accommodate and load-balance these new behind-the-meter generation sources that will be sending electricity back to the grid at certain times of the day. Making the widespread deployment of DER and microgrids a reality also will depend heavily on cooperation between municipalities, utilities, customers, regulators and manufacturers. When polled on who should be the dominant owner/operator of microgrids in the future, survey respondents overwhelmingly pointed to partnerships between utilities, non-utilities and the public.